194 A Stewart Truswell, “Review of dietary intervention studies: effect on coronary events and on total mortality”, Australian New Zealand Journal of Medicine, (1994). 195 World Health Organisation European Collaborative Group, “European collaborative trial of multi-factorial prevention of coronary heart disease: final report on the 6-year results”, The Lancet (1986). 196 The Multiple Risk Factor Intervention Trial Research Group, “Mortality Rates after 10.5 years for participants in the Multiple Risk Factor Intervention Trial”, Journal of the American Medical Association (JAMA), (1990). 197 The Multiple Risk Factor Intervention Trial Research Group, “Multiple risk factor intervention trial: Risk factor changes and mortality results,” Journal of the American Medical Association (JAMA), (1982). 198 George Christakis, Seymour Rinzler, et al, “The anti-Coronary Club: A Dietary Approach to the Prevention of Coronary Heart Disease – a Seven Year Report“, American Journal of Public Health, (February 1966). 199 George Christakis, Seymour Rinzler, Morton Archer, Arthur Kraus, “Effect of the Anti-Coronary Club Program on Coronary Heart Disease Risk-Factor Status“, Journal of the American Medical Association (November 1966). In the intervention group there were 18 deaths from other causes and 8 from CHD compared with 6 deaths from other causes and none from CHD in the control group. 200 Gary Taubes, The Diet Delusion, (2007). 201 Schatz, Masaki, Yano, Chen, Rodriguez and Curb, “Cholesterol and all-cause mortality in elderly people from the Honolulu heart programme”, The Lancet, (August 2001). 202 Anderson, Castelli and Levy, “Cholesterol and Mortality: 30 years of follow-up from the Framingham Study”, Journal of the American Medical Association (JAMA), (1987). 203 Elaine Meilahn, “Low serum cholesterol: Hazardous to health?” Circulation, (2005). 204 Dr. Malcolm Kendrick, The Great Cholesterol Con, published by John Blake, (2007). 205 Natasha Campbell Mc-Bride, Put your Heart in Your Mouth, (2008). 209 Eugine Braunwald, Braunwald’s Heart Disease: A Textbook of Cardiovascular Medicine, 9th edition (2009). 210 Barbara Howard et al, “Low-Fat Dietary Pattern and Risk of Cardiovascular Disease, The Women’s Health Initiative Randomized Controlled Dietary Modification Trial”, Journal of the American Medical Association”, (February 2006). 211 Andrew Mente, Lawrence de Koning, Harry S. Shannon, Sonia S. Anand, “A Systematic Review of the Evidence Supporting a Causal Link Between Dietary Factors and Coronary Heart Disease” Archives of Internal Medicine, (2009). 212 Patty W Siri-Tarino, Qi Sun, Frank B Hu and Ronald M Krauss, “Meta-analysis of prospective cohort studies evaluating the association of saturated fat with cardiovascular disease”, American Journal of Clinical Nutrition, (March 2010). 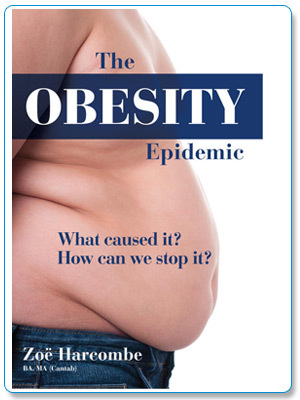 "The Obesity Epidemic is the most comprehensive demolition job on the arrogance and ignorance of the health profession I have ever read".